THE SPANISH MAID BY EMILE GRIMSHAW. BRIDGET CRUISE & SQUIRE WOOD'S LAMENTATION. BY CAROLAN. 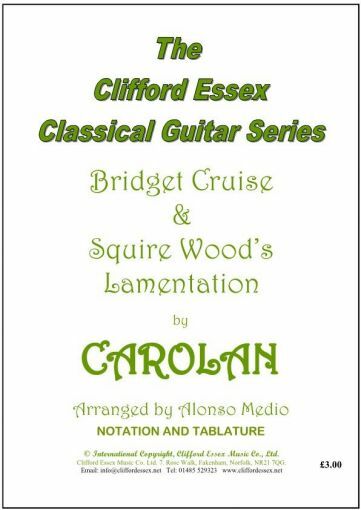 Location: /Sheet music/Guitar Series/BRIDGET CRUISE & SQUIRE WOOD'S LAMENTATION. BY CAROLAN. Carolan (1670 to 1738) was a famous Irish blind harper who made a living by visiting local families, mainly the gentry, and playing in return for his keep. He frequently composed short pieces, and dedicated them to his patrons. Bridget Cruise was rather special because he had fallen in love with her as a teenager, before he was blinded by the smallpox. 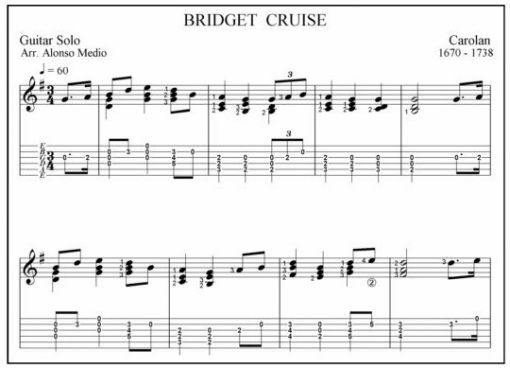 He wrote several pieces for her, and this one is known as ‘Bridget Cruise: Third Air’. It is a lovely melody, and quite easy to play. Squire Wood was a wealthy mine owner who was given authority by the British Government to issue copper coinage because of a supposed shortage. The Irish Parliament had not been consulted, and there were suspicions of bribery, which resulted in universal opposition to the coins, and Wood lost a great deal of money. 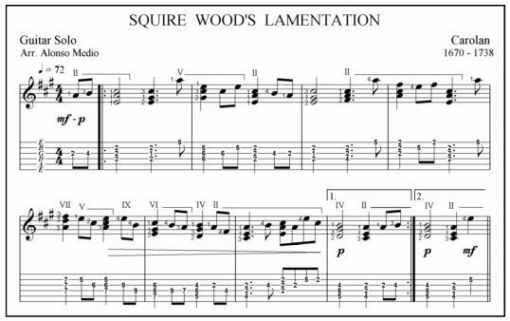 The full title of this tune is ‘Squire Wood’s Lamentation on the Refusal of his Halfpence’, and it is possible that Carolan wrote it to fit some satirical verses about the unfortunate Squire. The words, if any, have been lost, but this remains a hauntingly beautiful melody, which is not difficult to play on the guitar. BMG Magazine - Founded by Clifford Essex in 1903. IN LANGUID MOOD. A TRIBUTE TO EDDIE LANG. BY LOUIS GALLO.